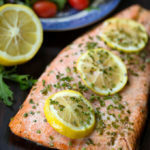 Baked Steelhead Trout is a tender and delicious fish, prepared simply. Living in Washington State has some perks. Especially in nature. We have many lakes and rivers, and of course the majestic Puget Sound (my absolute dream is to live on one of the San Juan Islands). Why all this talk of water? Because today I want to talk about fish. Specifically, the amazingly delicious Steelhead Trout. Up here we just call them Steelhead (or Steelies). We mainly fish for them in the rivers. My favorite spot is on the Stillaguamish River, where they like to hide in the cool dark pools next to huge round river rocks. The Steelies like those cool and green rushing rivers, with their gravelly bottoms and abundance of mossy river rocks. Steelhead are unique trout because they can live to 11 years and reach upwards of 55 pounds (which most don’t)! But what’s even cooler is that they are born in the fresh water, migrate to the salt water, spend years there, (males take 2 years to mature) then return to the fresh water to spawn. And, they can spawn more than once! All of that time they spend in the cold marine (and river) environments makes them develop a good tasty layer of fat. You can skip your fish oil supplement in Steelhead season, because these trout are packing! Steelhead is for sure my favorite trout, and my second favorite fish only to Copper River Salmon (another fatty. Yay for fat!). I have prepared Steelhead many ways, some fancy and some basic. I prefer the basic because the flavor is so soft and gorgeous, I don’t like to cover it up. Enhance it with a light hand and prepare Baked Steelhead Trout. If you don’t fish, look for Steelhead at your local fish monger. We like to go to Pike Place Market to get fresh local Steelhead Trout. Serve Baked Steelhead Trout with a fresh salad and some crusty bread and it’s GLORIOUS! You can be an honorary Washingtonian! 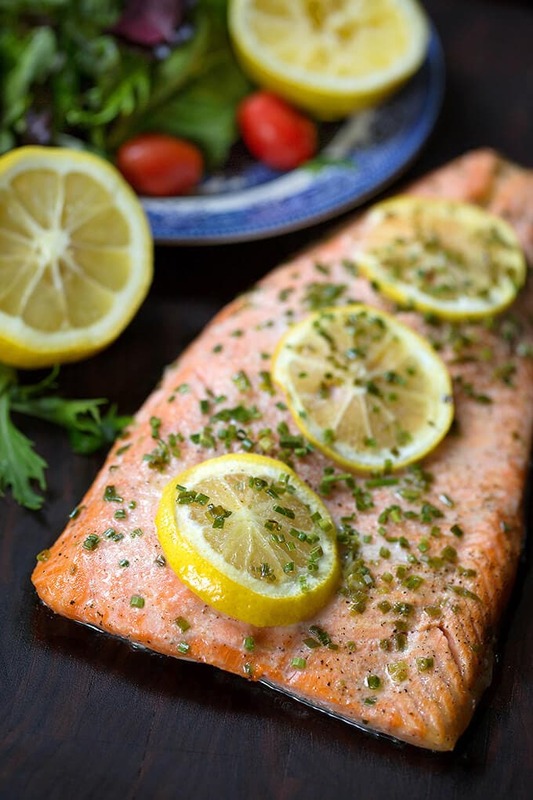 Simply prepared fresh Steelhead has a rich, full flavor that isn't too fishy, and has amazing texture. Healthy and yummy! Heat oven to 325° degrees. 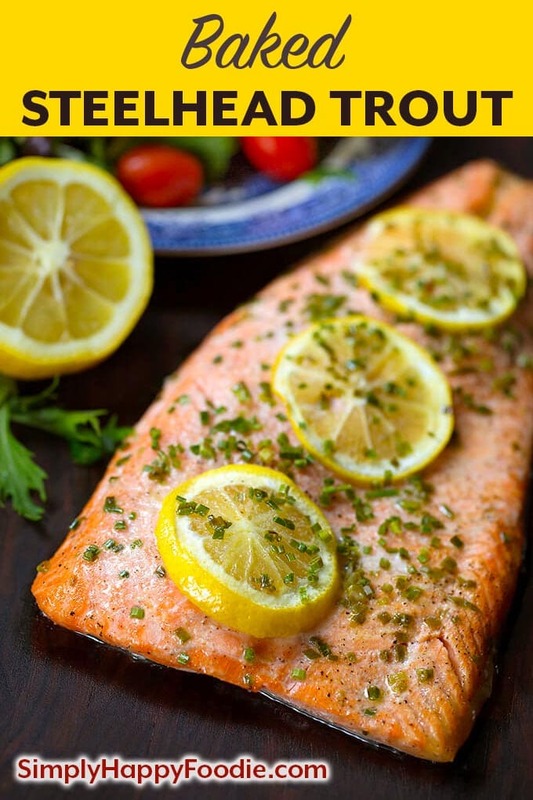 Place a piece of parchment on a baking tray that is large enough for your steelhead filet. Place steelhead filet on the parchment skin side down (no need to spray or oil as the parchment will keep it from sticking). Squeeze the lemon juice over entire filet. Keep 3 or 4 lemon slices aside. Sprinkle Kosher salt, pepper, and the garlic powder over the filet. Place the lemon slices on top, along the length of the filet. Sprinkle the chives liberally over the filet. Lightly drizzle with olive oil, not too much, just enough to lightly coat filet. This will help give a gentle browning while keeping the chives from drying out. Bake for about 20 minutes. The larger and thicker filets may require more cook time. I usually check it after 15 minutes, just to be sure. 20 minutes is my average cook time. I usually cook filets that are about 1 to 1 1/2 inches thick. Just watch it and don't let it over cook. Note: If you like your fish on the rare side, please be cautious as undercooked seafood could be unsafe.